Debate over law to finally grant Jews the right to pray at their holiest site sparks angry response from Muslim MKs. A Knesset debate on the implementation of equal Jewish prayer rights at Jerusalem's Temple Mount degenerated into a shouting match Monday, as Arab Knesset Members used threatening words and aggressive body language to disrupt the meeting. Chairwoman of the Committee of Interior, MK Miri Regev (Likud), appeared largely helpless in the face of an angry onslaught by radical Arab MKs, who were eventually removed by orderlies after launching a string of angry invective towards Regev and another female MK. According to a proposed law, tabled by MK Rabbi Eli Ben-Dahan (Bayit Yehudi/Jewish Home), daily prayer hours would be set for Jewish groups visiting the Temple Mount, which is Judaism's holiest site. Despite its supreme significance to Jews throughout the world, Muslim pressure has resulted in a raft of discriminatory measures against Jewish visitors by Israeli Police, including a total ban on Jewish religious activity there. Violators of the ban are arrested immediately, and often slapped with a ban from ascending the Mount altogether. The laws, if passed, would be a monumental upholding of Israel's official stance of religious freedom. While Israel officially liberated the Temple Mount from Arab occupation during the 1967 Six Day War, the government controversially handed back control of the Mount to the Islamic Waqf foundation, which has been accused of implementing a campaign of Islamization, including the systematic destruction of Jewish artifacts, aimed at erasing all traces of Jewish history at the site. During the stormy debate over the law, Regev explained the rationale behind it, saying that "We cannot have a situation in which a state cannot realize its sovereignty and people can't pray at sites holy to them." Regev further stressed that "we don't want to go into Al Aqsa [mosque] or prevent you (Muslims) from praying there, but want to enable Jews to pray on the compound as well." But MK Muhammad Barakeh (Hadash) warned that Arab MKs would physically prevent the implementation of equal prayer rights at the Temple Mount, shouting that "Whoever comes to defile the Al Aqsa Mosque will find us there!" MK Ahmed Tibi joined the fray, warning that: "The Second Intifada began because of Al Aqsa, and because of you it will erupt because of Al Aqsa... you are a pyromaniac." "You say that as a friend of Yasser Arafat," said MK Orit Struk (Bayit Yehudi). "I am proud to be Arafat's friend... his shoe is worth ten like you...", replied Tibi, who later called out at a female MK who was off-camera, possibly MK Struk, "You are a dangerous woman, a pyromaniac. You endanger your children, not just ours... You are a lowly settler.. on the land of others..."
In September, Tibi sparked controversy by declaring that the Temple Mount “is a place of prayer for Muslims alone," and accusing Jewish worshippers of "contaminating" it by visiting it. MK Moshe Feiglin urged Regev to eject the unruly MKs for breaking Knesset protocol, after calling her a "pyromaniac" and accusing her of "chutzpah." Obviously pleased with the way he had denigrated the Knesset, MK Tibi finally left the room as he said in Arabic: "Yalla, out, out, you... animals." It is not clear whom he was addressing. 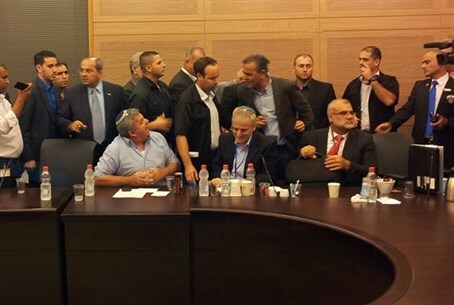 The scene was typical of the way extremist Arab MKs have been behaving in the Knesset since the mid-1990s, when radical Arab leaders like Ahmed Tibi (Raam-Taal) and Azmi Bishara (Balad) entered the Jewish state's parliament. A decision by the Election Committee to disqualify the radical lists in 1997 was overturned by the High Court.